I am going to write an algorithm for increasing the volume of a signal with a pot (expression pedal). I know that in most audio applications, you adjust volume levels in the decibel scale, since logarithmic change translates better to a person's perceived volume difference. 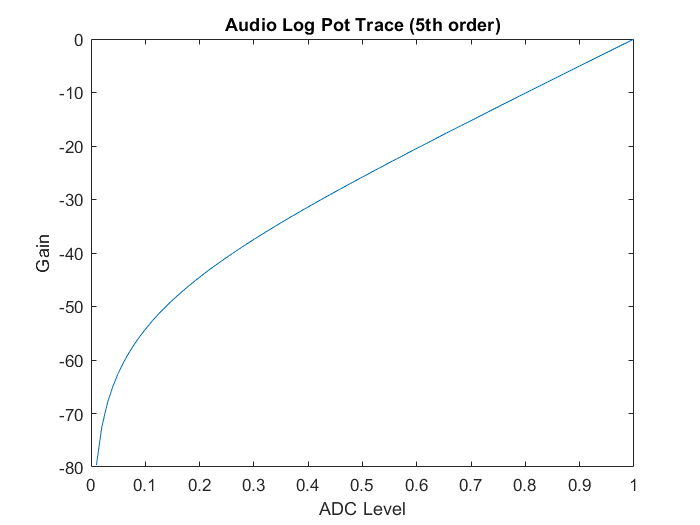 If I were to just map an input from one of the analog inputs to a number to be multiplied by the signal, this would increase the volume linearly, correct? I assume so, since you are just multiplying a floating point number (the signal) by a gain value (mapped from pot). If that is the case, would it be possible to map an input to a logarithmic value to be multiplied by the signal? And if anyone has any experience with volume pedals (for keyboards or guitars), do they typically increase logarithmically or linearly? I would assume logarithmically. Edit: I know that you can buy logarithmic pedals (as most volume expression pedals are), but the pedal I'm working with has a (mostly) linear resistance change. There are a few ways to do this. On the BeagleBone you have a built-in FPU which can do ex very efficiently. As I found out I think it can do this with the same computational cost as a floating point multiply. This is the basis for a reverse-log audio taper pot function (if you want to see the log shape, just turn it on its side, swapping x&y variable). Changing "shape" variable effectively changes the pot taper curve. 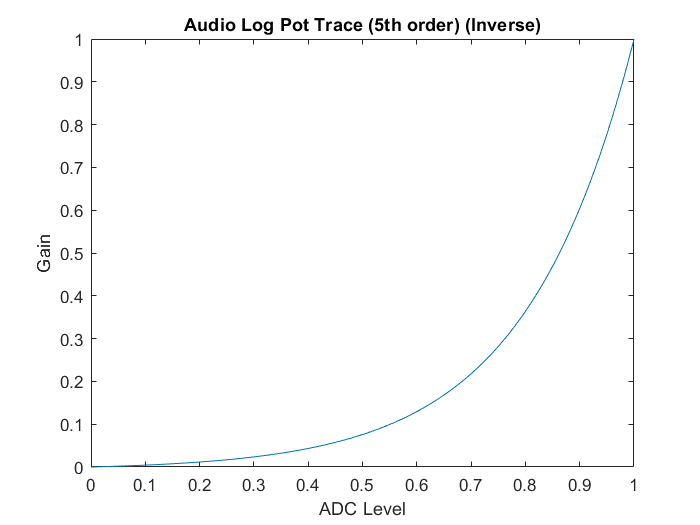 Put this function in MATLAB or Octave if you want to generate data to overlay on pot taper functions from a specific audio pot datasheet. You could even use Bela to curve-trace a specific audio pot and reproduce the curve for multiple inputs using cheaper linear pots. I'll probably overlay them with some other log pot traces and try and fine tune it to something similar. This was just a quick sketch of the two. peterpanman3 man, can't keep away from you on these forums can I? oh ok, sorry I didn't follow the whole thread and I thought you were maybe trying to plot the behaviour of a "log" and an "inverse log" pots. 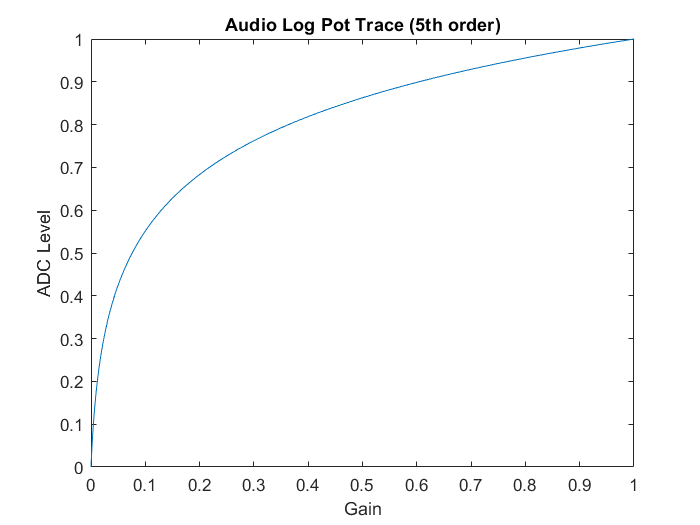 For whatever it's worth, you can get a log-linear plot with just e((1-x)*ratio) but the effect is usually disappointing for volume control purposes since the only way to get the "0" level below audible is to make the slope so steep the output is only audible for last 1/4 turn of the pot. The effect of the "shape" parameter is to set the slope of the line once you bend out of that knee from neg infinity dB. The e^x-1 type of function allows the volume to go down to -infinity dB, but quickly pulls out and bends the knee where you set it with the shape parameter. Then the volume comes up log-linear for the remainder of the pot turn. As you can see, with a parameter of "5" it starts to go log linear between -60dB to -40dB. At -60dB on most systems you can just barely hear it, and it's usually faintly audible at -40dB. Having most of your pot turn operate linear dB from -40dB up to 0dB tends to feel right, but of course this is all subject to perception.